Under the Columbia banner, Humphrey Bogart and his own Santana Production outfit presented this courtroom effort to the movie going public of 1949 by way of director Nicholas Ray. It is for me a lesser effort from our iconic star but better to have a bit of Bogie acting tough than never at all. Truthfully the film acts as a showcase for the young John Derek getting an “introducing” credit as the film gets underway. 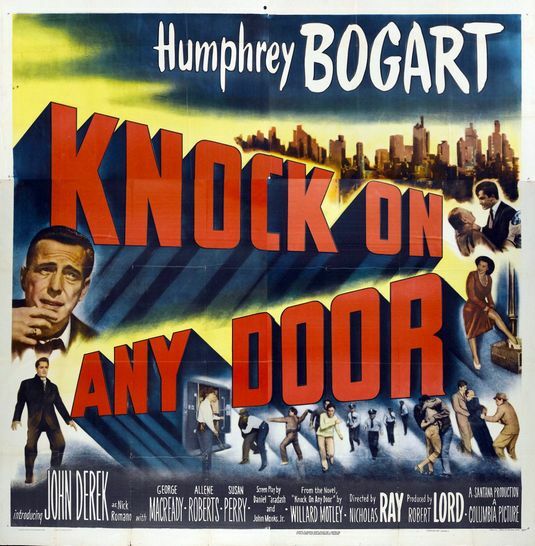 Harkening back to the pre-stardom days of Bogie’s career, this story plays like it comes from the universe of the Dead End kids with Derek taking up the duties of Billy Halop while Bogie to a certain degree takes over the ………. Bogie role of Crime School. All we need to do is pick up the action a couple years later. Derek plays a young career criminal with a long rap sheet to prove it. He’s targeted and arrested as the film opens after the shooting of a police officer. Denying he had anything to do with it he calls upon Bogie, a man he has known since adolescence to come to his aid. 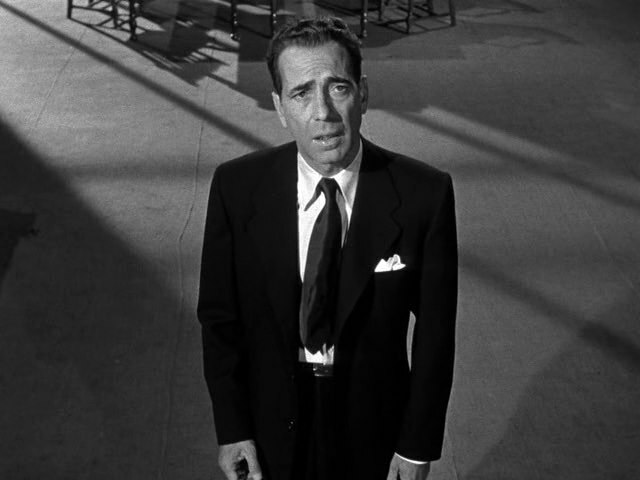 Bogart stars as a lawyer. A kid who made good and got himself out of the slums. At first he wants nothing to do with Derek who he views as a lost cause but in an amusing scene with his on screen gal, Susan Perry (no relation to yours truly) he gives in and takes on the task of defending Derek against the charges and a rather villainous district attorney played by the George Macready. A man it’s always easy to dislike on camera. This helps to put Bogie squarely on the right side of the case for all of us cheering him on. As a matter of fact there’ll be more than one heated debate on the courtroom floor where you’ll be rooting for the Bogie we all know and love to lay out Macready with a patented right cross. If it wasn’t for the presiding judge, Barry Kelley, injecting the power of the bench in between the two, we might been treated to just that. Much of this film will be told in flashback as Bogie brings the jury up to date on Derek’s life. What brought him into a life of crime. From a father who died in prison to being abused in reform school (hints again of Halop and the Kids) to hanging out with the wrong crowd in the neighborhood. “Only suckers work.” About the only good thing the kid has encountered is the love of the girl next door, Allene Roberts. They’ll marry and Derek at Bogie’s urging will attempt to go straight. During these flashbacks we’ll get to see a bit of the Bogie shuffle. He’ll play it tough roughing the young man up when the scene calls for it but he can never totally abandon Derek who through it all still has a decency about him. One that is brought out by his new bride. 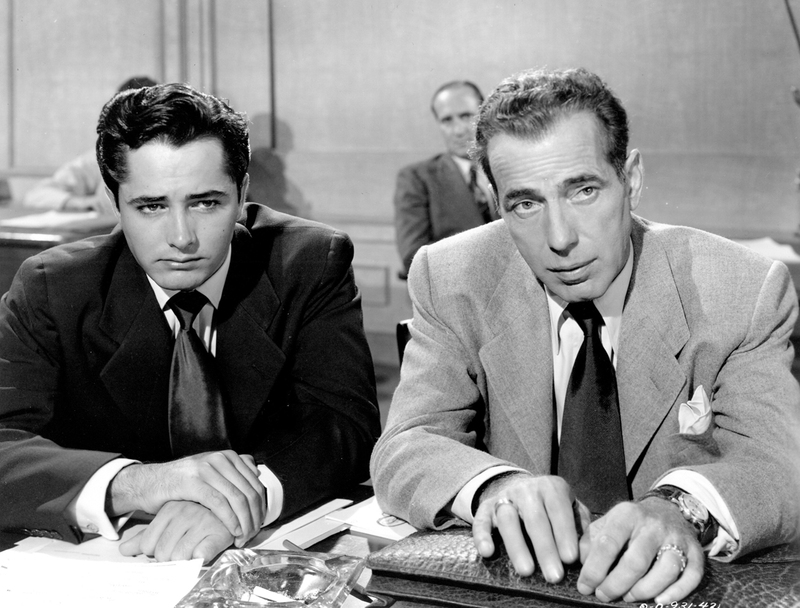 Back to the present for the balance of the film as Bogie goes into overdrive on the courtroom floor looking to prove the young man’s innocence by tearing apart the flimsy witnesses the prosecutor, Macready has tabled for the jury to hear. Did he do it or didn’t he? I’m not about to play spoiler. While I’m all for Humphrey Bogart in pretty much anything and that includes The Return of Doctor X for the camp value, I think I’m fairly safe in putting this effort in the lower half of Bogie efforts. If it was a comedy or otherwise, I wouldn’t necessarily expect to see Bogie in his element but here he’s in a crime drama minus the scenes and schtick that made him an icon of cinema. And even then one can’t take their eyes off him. There’s a reason why he’s ranked at number 1 on the AFI’s list of the greatest film stars of the twentieth century and why I’ve been a fan since childhood. Bogie’s next flick with director Ray, In a Lonely Place, would prove to have far greater impact over the years than this one did. Other actors to appear alongside Bogie and Derek include a list of familiar faces. Among them, Sid Melton, Dewey Martin, Chester Conklin, Davis Roberts, Jimmy Conlin and everyone’s favorite piano player, Dooley Wilson. As for John Derek, I guess growing up at that moment in time when Bo Derek was starring in 10 running down a beach causing a stir amongst the male population who had a pulse followed by Tarzan, most of my inner circle of friends and I were more than a bit jealous of the old timer with the young gal on his arm. 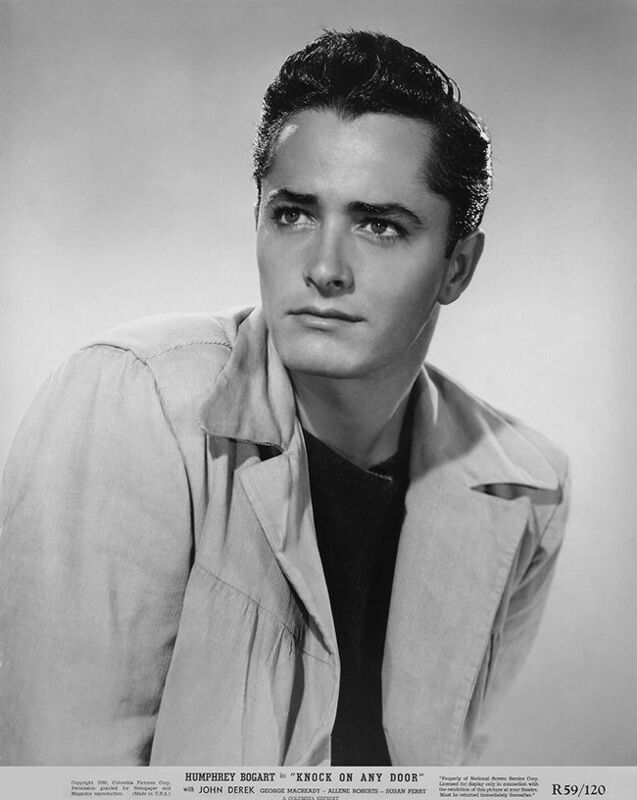 I was never quite sure if my Mother was pulling my leg while watching The Ten Commandments over Easter Weekend and telling me the truth that that was the John Derek married to dream girl Bo. John all but quit acting in the mid 60’s even directing a couple of films with then wife Ursula Andress. He’d carry on years later with his directorial career with Bo front and center in the 80’s. To say their productions were less than stellar would be understatement but I’m not about to complain where Mrs. Derek is concerned. 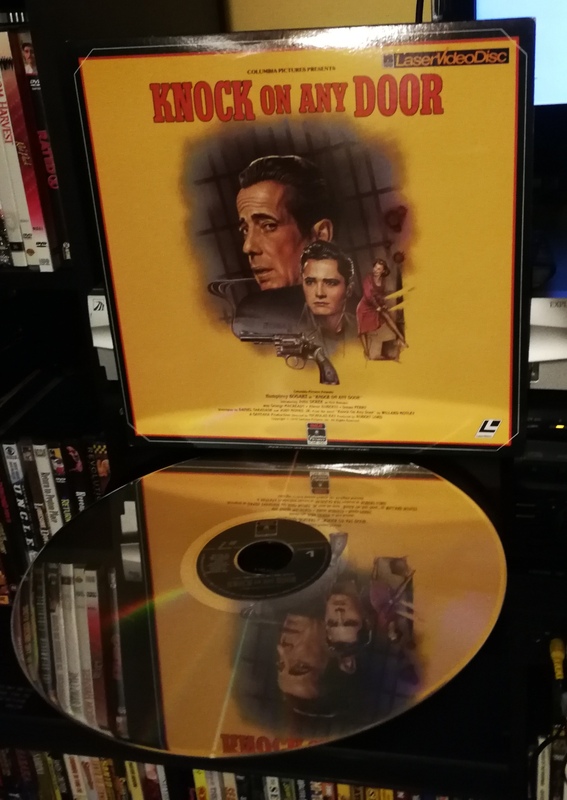 Not owning this one on either DVD or blu ray I had to resort to my laserdisc copy and fire up the machine. Keep your eyes peeled to TCM or order it via the Bogart DVD set it’s part of from the TCM vault. Unless of course you have it on VHS or one of these bulky discs like yours truly with the cool cover art. I feel about the same as you do on this, Mike. The fact it’s Bogart and Nicholas Ray means there’s always going to be some positives, but it has to be said the pairing also creates certain expectations and I don’t feel they’re ever met. Actually, I feel that way about much of Bogart’s Santana productions output – just a little lacking. I think Derek was good enough performer and I’ve liked his work in a number of films. Good call too on the Dead End Kids vibe – that is there and, while interesting, I wonder if it’s not part of the film’s problem. It’s almost as though the movie was trying to capture something that belonged to an earlier period, and that tends to represent a risk any time it’s undertaken. Yes the Santana films lack that certain something the Warner Brothers efforts had for Bogie. A sign of the times with the actors pushing the studios to let them control there own destiny and it didn’t always work. 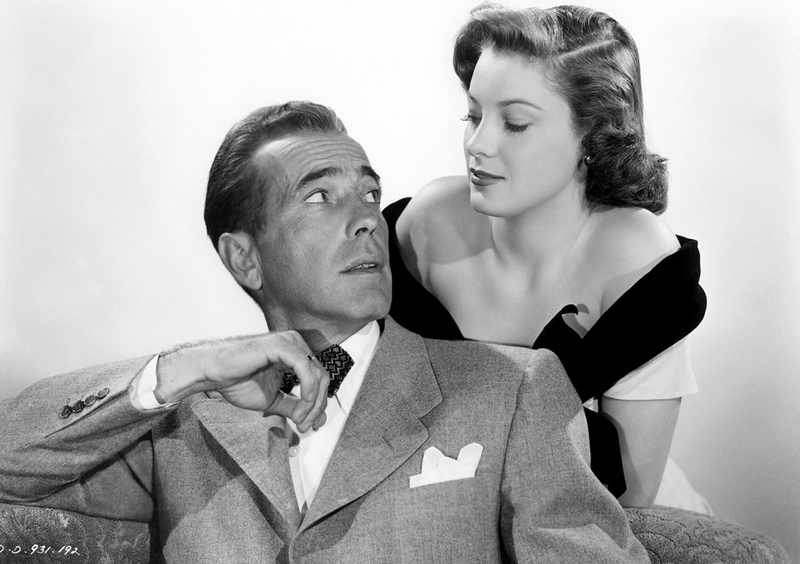 But it’s always hard to deny Bogie when all is said and done. Give me another 10 years and I’ll probably watch it again. Generally, his post-WB efforts were a mixed bag with some really good stuff rubbing shoulders with the mediocre. Just watching Bogart though, even in his lesser vehicles, is never a total loss – there’s always something good to take away. I’m slowly but surely working my way through all the best bits of his work. This was on my radar but I may push it down a touch now. Well I do still have “In a Lonely Place” to see 🙂 and I can’t wait to watch it very soon. Love the laser disc. They are marvel to see in the shops though I’ve never watched one. Remember hearing the quality was amazing. If a laserdisc player had a HDMI cable would they be up with Bluray quality? No I doubt it. Better than VHS at the time. Dvd. Quality in some cases I guess. Some are collectible now. Nice artwork on some. I’ve come across them when digging in record shops, what with being 12″ as well. A few times I thought I’ve come across a soundtrack and then realise it’s a laserdisc. I bet they are quite collectable now, can’t of been that many made I guess. The machines are probably more rare and harder to come by now than the discs themselves. Thankfully I still got one in working order.